A Jew fills out form for identification card. This lesson is part of a five-part unit on the Holocaust. Previously, students have filled out Ogle's (1986) K-W-L chart (What you Know, What you Want to Know, What you Learn). They have completed a short historical research project and have viewed Gerda Weissmann Klein's video memoir One Survivor Remembers. 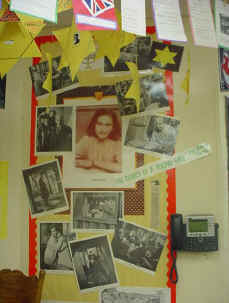 Following the Stars of David lesson, students read a novel, memoir or autobiography written about the Holocaust. To personalize the historical events of the Holocaust for students. To help students recognize Jews as the primary victims of the Nazis and their collaborators. To help students recognize the importance of survivor testimonies. Students will determine six significant aspects of a person's biographical sketch. Students will learn about the diverse Holocaust experiences of several individuals. Students will interpret and develop summation statements about an individual's culture, background and ultimate fate. The teacher should model this lesson by providing students with an example of the completed project. Using the set of Identification Cards provided by the Resource Center for Educators of the USHMM, the teacher should choose the cards which describe the life and experiences of Jewish people. Prior to the lesson, the teacher should prepare enough triangular templates (approximately I 0 to 12 inches per side) for students to use in groups of four. Students will make their own Stars of David by tracing the templates onto yellow construction paper and gluing them together appropriately. Copies of Identification Cards are then distributed to students randomly. They will read them either to themselves, orally for the entire class, or in their small group. The teacher should explain the way that the information on each ID was researched and organized. The students will then complete the objectives of the lesson by choosing and highlighting six factual statements about each person whom they choose to focus on. The statements are then transferred to the Star of David, one for each point of the star. A photocopy of the picture of the victim or survivor is then placed in the center. On the back of each star, students write the date of birth and fate of their chosen individual. As students completed their stars, we hung them one-by-one on the chalkboard. The effect of the stars multiplying as we went through the day of classes was very dramatic. 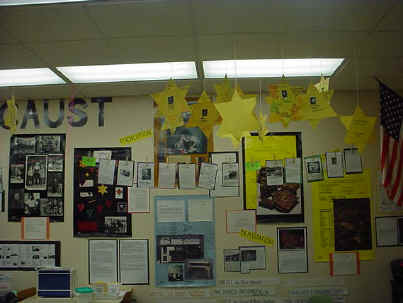 Finished stars can be hung in the classroom on the wall or from the ceiling (see Exhibit). Identification Cards from the USHMM Education Resources Division. The project was evaluated on the basis of factual statements, completeness and neatness.